This beautifully decorated split level duplex truly is a hidden gem in the heart of the city. 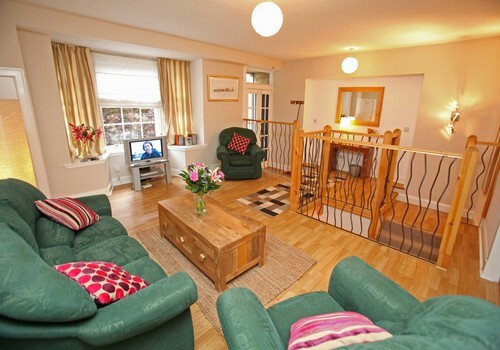 It is the kind of apartment that you would like to own and is a perfect retreat for both long and short stays. 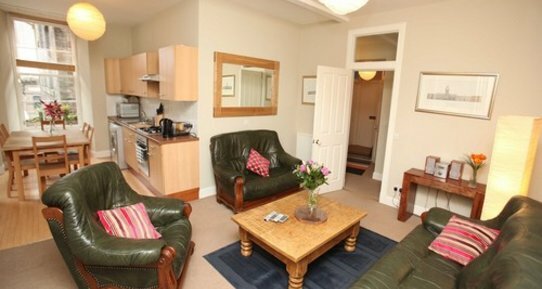 The property is located in walking distance of many of Edinburgh's popular tourist attractions and is close to a lively nightlife area making it much more suitable for groups there to enjoy that aspect of Edinburgh. On entering the apartment you step straight into a spacious lounge area which is dominated by the wooden staircase in the centre of the room. Tastefully decorated there is TV, DVD player and stereo system. The kitchen is fully fitted and equipped with microwave oven, gas hob and electric oven and crockery for up to four persons. A fold away kitchen dining table is perfect for up seating up to four. 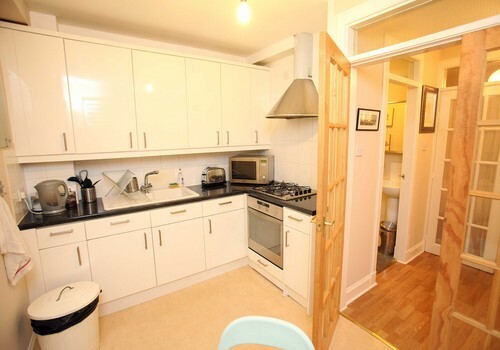 There is a separate utility room with washing machine and American fridge. 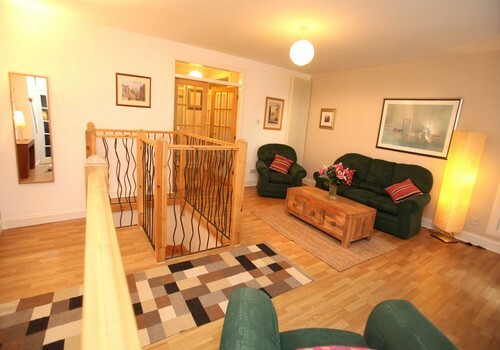 The wood panelled apartment hallway provides plenty of space for luggage and coats etc and there is a toilet and shower located off the hall. 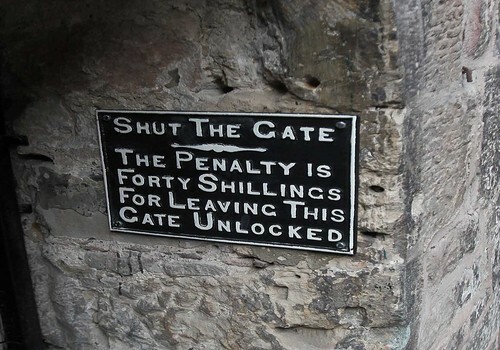 Linger a while to check out some of the scenes of bygone Edinburgh. 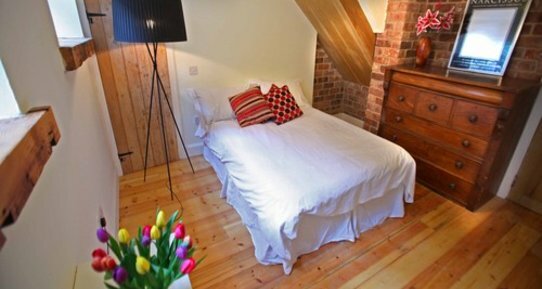 The bedroom takes up the whole of the lower level and has a beautiful en-suite bathroom with shower. Double glass doors at the entrance to the bedroom provide privacy from the lounge. 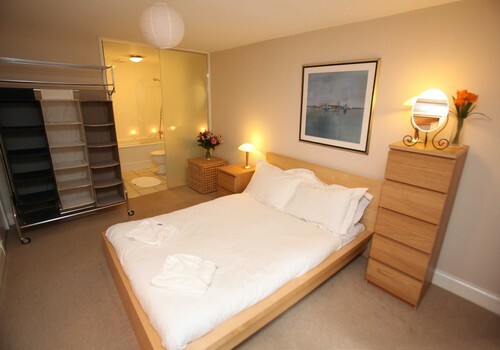 This is a large windowless room situated next to the wc/shower room on the main floor that contains a double bed and has ample storage and hanging space. 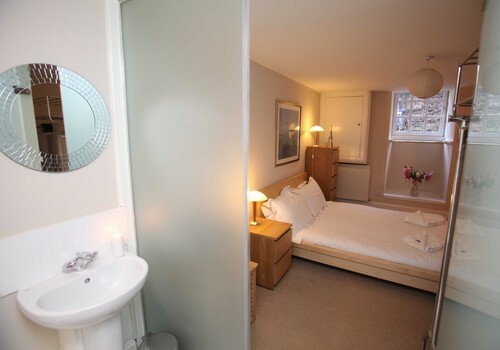 Due to this room not being a proper bedroom because of the lack of a window this apartment has been priced just slightly above the rates for a 1 bedroom property as it is marketed as such. Ventilation is provided by leaving the door ajar or a externally vented fan. 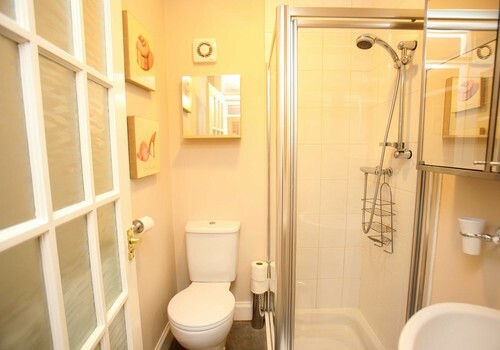 Upstairs next to the additional sleeping area, is serviced by a shower-room with power shower. WC also here. 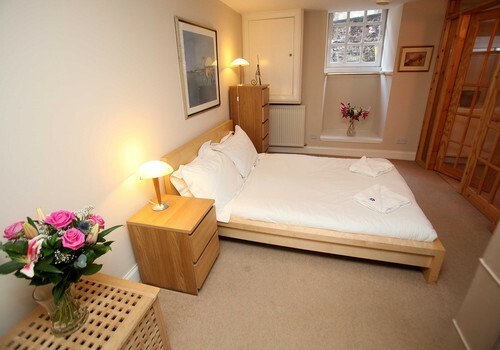 * Linen and towels are provided and are changed weekly for rentals of 1 week or more. * The airport bus drop off point and main railway station are 10 minutes walk. A deposit of 25% is payable on booking and the outstanding balance of the rental price must be received 2 months prior to your arrival date. For bookings made less than eight weeks before your arrival date the whole rental price falls payable at the time of booking. 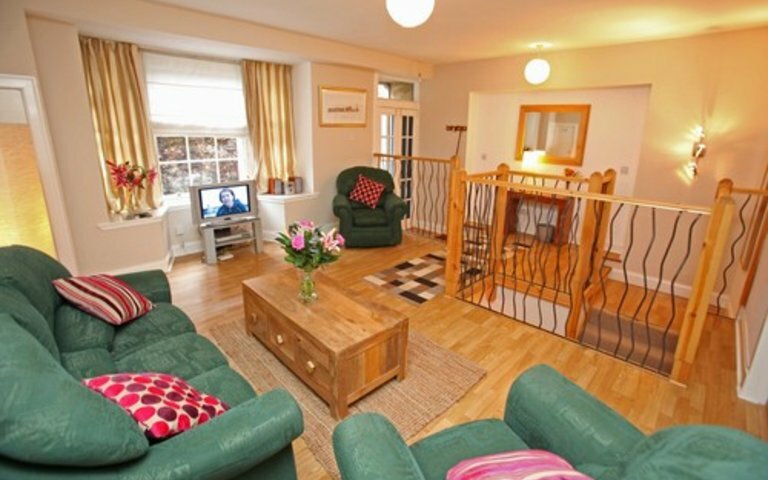 Please note that ESC only provides an enquiry & booking service for this property. The owners manage the operation of the property themselves. 1There are three options to get from Edinburgh airport to the city centre, all take approx 30-35 minutes. The main rail station Waverley is approx 250 metres from the apt. 1. Edinburgh trams, approx every 8-10 mins (Sunday 12-15 mins), right outside terminal, the nearest drop off point for the apt are the Princes St and St Andrew Sq stops both are approx 900 metres away. Cost 8.50 pounds for adults and 4.50 pounds for children for a RETURN journey. 2. Airport express bus, every 15 minutes right outside terminal building, drop off point on Waverley Bridge approx 400 metres from apt. Costs 7.50 pounds per person for a RETURN journey. 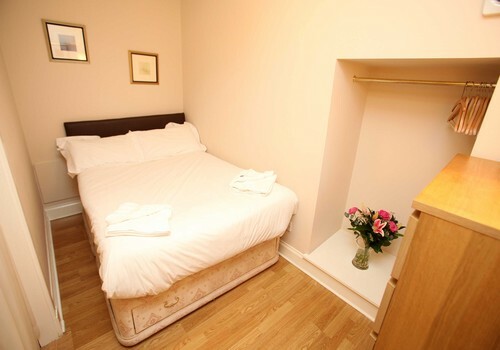 The second sleeping area is technically a small bedroom but it does not have a window. It has a double bed in it.